View More In String Lights - Page 2. The Starry Starry Lights are made with a fine bendable copper wire that can conform to any shape to add a beautiful decorative accent. Flexible yet durable, the string lights are perfect for positioning lights to curtain, any decorative or holiday project. Warm white LED's are individually mounted along the string and provide an elegant sparkling glow that can be seen from any angle. Please note: The strings are waterproof and are fully submersible in water, however the plug is not. The plug can be used outdoors in a covered area, and can also be used in a non-covered area if it is used with a waterproof electrical box. 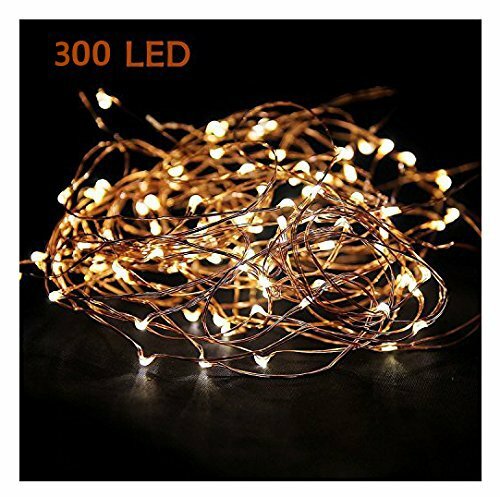 LED String lights composed of Ultra Bright Warm White Color Micro LEDs that don't overheat giving a light fairy effect. After hours of use, they are completely safe to touch without risk of burns. The LED Starry Lights are safe for children over three years and for pets. Starry Lights apt for both indoor and outdoor settings. These hanging lights or led wire lights are suitable for wedding decorations, and it will satisfy all of the light needs for the event, as its luminosity is enough for the entire room! Leds Light String IP-65.Low voltage,transformer included,AC/DC Power Adapter 110-240V for use in U.S.A. Output 5V1A. Made with environmentally-friendly materials. Meets UL certification. With a 20,000 hour lifespan, they can stay lighted for as long as needed. Handle with care! Even though the starry star lights are built strongly with top manufacture, they can still be broken by stepping on the LED bulbs or stretching out the copper wire. Comes with complete guarantee! Return if it is broken. If you have any questions about this product by MineTom, contact us by completing and submitting the form below. If you are looking for a specif part number, please include it with your message.